Pull down shades are inexpensive and typically look that way. They are not my favorite option when dressing a window. But my friend Kathleen from Grosgrain showed me how amazing pull down shades can truly be with a little imagination, some math, and some ribbon! Hop on over for the full tutorial and free template in case you want to make your own. 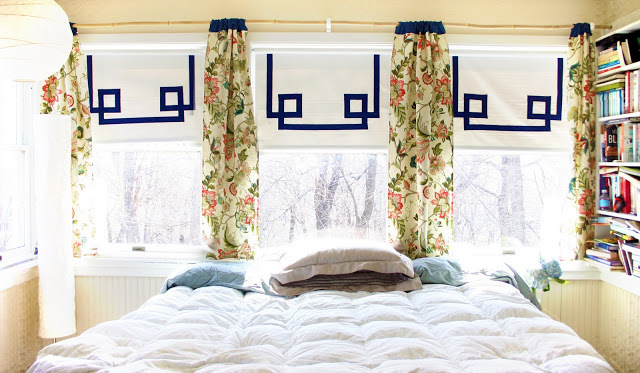 I loathe roller shades, but alas, they are one of the few that I can readily find in my odd 72″ wide window size. I recently painted my ‘has been’ burgundy shades the same as the wall color, then added a hand-drawn stencil. I’m quite pleased with the results, I might add. Although, I love the ribbon embellishment above. Something like that would have worked for me, if my windows weren’t so squat and elevated. Thanks for sharing the inspiration.